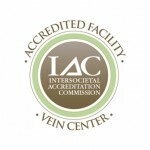 TLM LIVE environment > North Shore Vein Center > Blog > Uncategorized > We are AAAHC Accredited! The North Shore Vein Center is proud to announce that it is Accredited by the: Accreditation Association for Ambulatory Health Care, Inc. The Accreditation Association for Ambulatory Health Care (AAAHC) is a private, non-profit organization formed in 1979. It is the preeminent leader in developing standards to advance and promote patient safety, quality and value for ambulatory health care through peer-based accreditation processes, education and research. Accreditation is awarded to organizations that are found to be in compliance with the Accreditation Association standards. AAAHC currently accredits almost 5,000 organizations in a wide variety of ambulatory health care settings, including ambulatory and surgery centers, community health centers, medical and dental group practices, medical home, and managed care organizations, as well as Indian and student health centers, among others. We are also the official accrediting organization for the US Air Force and the US Coast Guard. With a single focus on the ambulatory care community, AAAHC offers organizations a cost-effective, flexible and collaborative approach to accreditation.